Container liners - Caretex - Transport of dry bulk products. Caretex fabricates and sells high quality and custom-made container liners for transport of dry bulk products in standard ISO containers. Caretex Liners are manufactured at our wholly owned plants in Thailand. This means you can rely on quality consistency in our liners. Caretex container liners are manufactured under highly clean conditions, from strong, durable, food-grade co-extruded virgin polyethylene film. Our total Customer Care Management (CCM) concept makes bulk transport in container liners the most cost efficient and user friendly packaging solution. 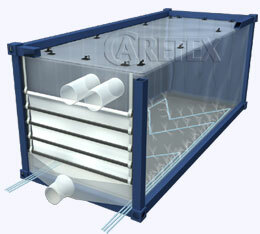 Caretex patented inflatable airbags and discharge spout constitute a true closed contamination free unloading system. Caretex provides well documented 3D drawings and specification to meet customer requirements with BS EN ISO 9001: 2008 statuses, by the certification Body of TÛV SÛD Management Service GmbH. Crown Holdings INC, a global leader in consumer packaging, is the owner of Signode Industrial Group and CARETEX is part of the Signode Industrial Group. Signode is a manufacturer of industrial protective packaging solutions and sells its products globally under a broad array of well-known brand names. With nearly 7,000 employees working across the globe the Signode Industrial Group maintains a leading market position through global scale, customer-focused innovation and a broad product portfolio. Signode Industrial Group’s global footprint includes operations in 40 countries across 6 continents, with sales to customers in approximately 60 countries.